One of the things I’ve learned about cutting down stress during the holidays is the importance of organization. Snapware gave me a set of products to help with a place for everything (and everything in its place!). I tried out three holiday solution products for review. 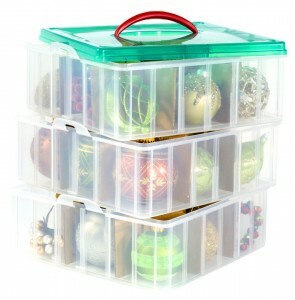 The first one is the ornament and seasonal storage Snap ‘N Stack seen at the right except mine has two trays. This is a great way to store those fragile ornaments that mean so much. I have a couple that were made by my sons when they were boys that mean the world to me. They are going right in here for safekeeping when the tree comes down! The second item I have doesn’t have a picture but is a six piece set cookie keeper. The three containers are 3.3 cup, 7,6 cup and 14.6 cup sizes with different varying holiday designs on the lids. The largest is dark green and has a gingerbread house design. The middle size is red with a Christmas tree motif and the smallest container is a lighter green with a reindeer. I’m going to use this as gifts filled with goodies so don’t tell anyone! The last container is a ribbon dispenser. I do not use ribbons so this will be given as a gift as well. 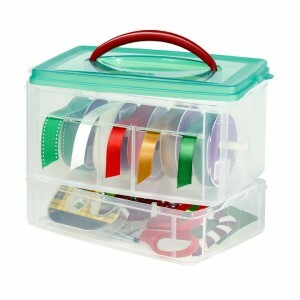 It keeps ribbons trangle free and has an additional tray for storing scissors and other accessories. If you would like to win this set of Snapware holiday solutions enter one or all of six ways listed below. For each entry, leave a separate comment. 1. Leave a comment with your best holiday organizational tip. 2. Subscribe to Buck$ome Boomer and leave a comment saying if it is via RSS or email. 3. Follow me on twitter and tweet the giveaway. 4. Follow Snapware on twitter. 5. Become a fan of Snapware on Facebook. 6. Become a fan of Bucksome Boomer on Facebook. This giveaway is open to those 18 or older and U.S. residents only. Entries close on December 12th at 5 p.m. Pacific Time and the winner will be selected via And the Winner Is… plugin. If there is not a response within 48 hours to request for mailing address another winner will be selected. Remember to leave an email address that you’ll be checking. Don’t forget to visit the other six blogs participating in the Gift Giveaway Bash this week. They will have some different items you’ll want to win! Disclaimer: I did not receive payment for this post although a set of Snapware Holiday Solutions was provided to me for review purposes. All opinions are strictly my own. I use to be organized until my granddaughter became mobile and she talk her papa into searching every closet for things that gma hides. Next post: Smiley Cookies Winner!